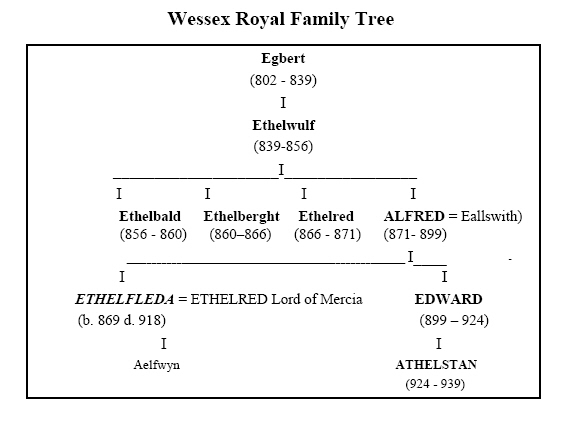 Ethelfleda was descended from King Egbert the first great Wessex king, who was given the title Bretwalda or king of the British, and his son King Ethelwulf. Alfred was Ethelwulf's fourth son and never expected to be king. When Alfred was a boy, his father took him on a pilgrimage and they stayed several months in Rome where they met the Pope This seems to have awakened Alfred's interest in both religion and learning. The other key people are Ethelfleda's husband Etheldred and the kings who followed Alfred, her brother Edward and her foster son Athelstan, who you will meet agin later. Alfred became King of Wessex at the age of 21, at the head of the remaining resistance to the Danes in southern England, following the deaths of his three elder brothers who had been king before him. After further defeats against the Danes, Alfred became a fugitive in his own country. According to legend, he took refuge in a cottage and his fortunes were so low that he was asked to look after the cakes while they were baking, but he forgot them and they burned! Alfred reassessed his strategy, built a fortified base at Athelney in the Somerset marshes and pursued guerrilla warfare against the Danes.